This Crockpot Brown Sugar Cola Glazed Ham recipe requires only 5 minutes of prep time to make this incredible brown sugar and cola glaze then pour it over the ham, set it and forget it for a few hours. You'll be rewarded with the most tender and delicious crockpot ham ever. Place the ham in the basin of a slow cooker. In a small saucepan, combine 1/4 cup of the brown sugar, cola, and mustard over high heat. Bring to a boil and make sure the sugar has dissolved. Pour the mixture over the ham. If your ham is pre-sliced make sure some of the glaze goes in between the slices. Take the remaining 1/4 cup of brown sugar and sprinkle over the top of the ham. Cook on low for 6-8 hours or high for 4-6 hours, basting with the cooking juices every few hours. 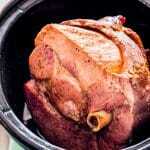 Remove ham from slow cooker and let cool a bit until it can be handled. Slice the ham and serve. If not serving immediately, preheat the broiler and transfer the ham to a oven-safe baking dish. Brush with some of the leftover liquid and broil for about 5 minutes, glazing with additional liquid as preferred. Nutrition information based on 5 lb ham.